So, does your little guy love to eat? Of course he does! And he’s likely not exactly the cleanest eater either, getting food and everything all over the place. He just keeps growing and eating until you can't believe where it all goes, right? Well, we have a certain…uhh…friend who's recently taken up residence in the warehouse who isn't too different from that. You remember Slimer, right? The green gluttonous and really, really, gross ghost from Ghostbusters? He sure likes to eat too. Unfortunately, he doesn't get a whole lot of the food or drinks in his mouth, and the ones he does end up going straight through him anyway! He is a ghost after all! He's also called Slimer because he's always inexplicably slimy or sticky in some way. Sound like a little one you know? We thought so. 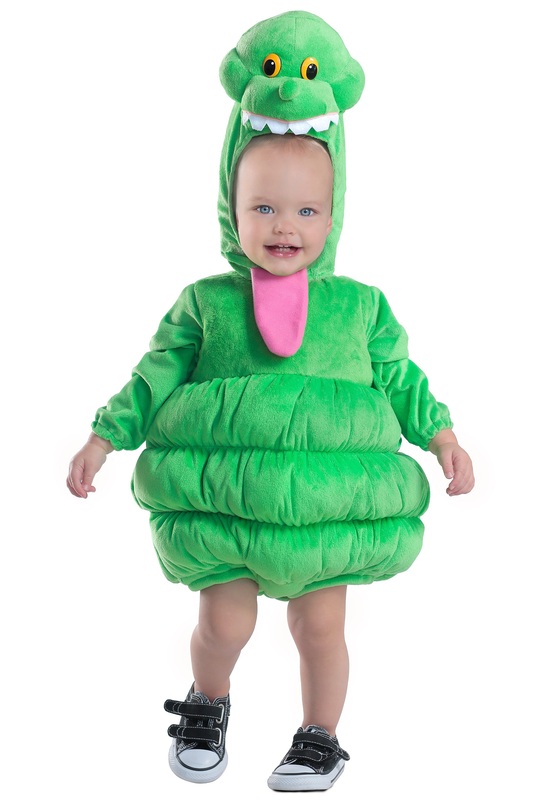 That's why we've decided to come up with a nice little Slimer replica costume so you can combine the cute parts of the green ghost with your own cute and sweet, messy little eater. The costume is officially licensed by Ghostbusters, so all the details are just right. It's a comfy outfit that's easy to slip on and has soft, sculpted belly rolls and a tail, just like the ugly little spud Slimer himself. It even has a hood that keeps the entire face showing, so you can always see your own little Slimer's smiling face. A pink tongue at the bottom of the hood looks like a little bib – perfect for catching the remnants of all that Halloween candy he will eat!